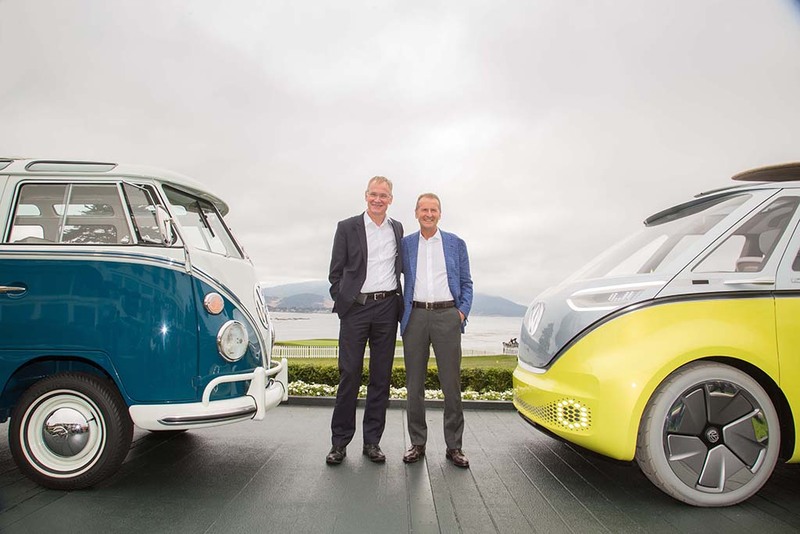 Seven decades after launching the iconic VW microbus, the company is now planning production of a new all-electric version, the ID Buzz. As was the case with the “Show Car of the Year” in Detroit, the production model will also have its batteries mounted in the vehicle floor. The electric drive doesn’t take up much space, which means the front and rear axles can be mounted very far apart from one another. This results in a long wheelbase and short overhangs, which makes for more space in the interior. “The vehicle therefore looks like a short compact van on the outside, even as it offers the generous interior space of a large van”, Diess explained. The result is a superior package that offers both the driver and passengers plenty of room for a comfortable journey. Ben Pon, whose family are very successful importers of Volkswagen vehicles in the Netherlands, also expressed great interest in the I.D. BUZZ in California. It was Pon’s father who inspired the development of the first VW Bulli (T1) with a sketch he made more than 70 years ago. Although Volkswagen’s oldest and newest, very evocatively designed MPV will be separated by more than seven decades when the new model is launched, the I.D. BUZZ has the original’s genes, as it offers maximum utilisation of space on the footprint of a midsize passenger car. Expansion of the electric vehicle range is part of Volkswagen’s Strategy 2025, which foresees more than 30 all-electric models by that time.